Zest is a food ingredients that is prepared by scraping from outer, colorful skin of citrus fruits such as Lemon, Orange, Lime. 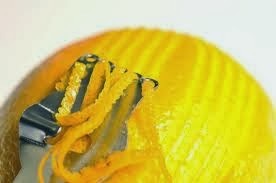 Zest is simply cut from the fruit with a knife. Zest is often used to add flavor to different pastries, sweets, desserts, cakes, cookies, pudding, candy and chocolates. 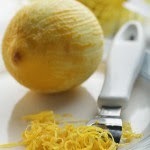 Zest also is added to certain dishes like sauces, salads, marmalades, sorbets. Zest is used in some cocktails and mock tails not only for flavor and aroma but also for color as a garnish.